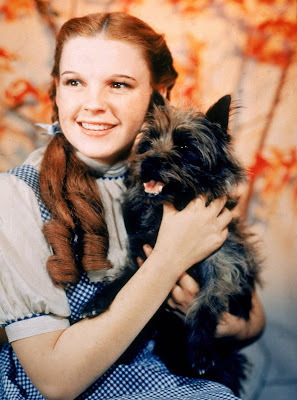 Today's song is Over the Rainbow performed by Judy Garland in The Wizard of Oz (1939). Over the Rainbow is probably the most famous song in old Hollywood history, but this lovely ballad that became Judy Garland's anthem almost wasn't included in The Wizard of Oz (1939). The Wizard of Oz, based on a children's novel by L. Frank Baum, was a prestige project for MGM, which was always the most luxe of the old Hollywood studios. MGM chief Louis B. Mayer liked to lavish money on prestigious spectacles that were both glamorous and wholesome, and Oz's combination of fantasy and feeling were just the thing for a musical adaptation. Judy Garland and Terry, aka Toto, in a publicity still for The Wizard of Oz (1939). MGM hired two young songwriters, Harold Arlen and E. Y. Harburg, to write the music for The Wizard of Oz, but the producers' original intention was to only have songs in the Oz section of the movie. Arlen and Harburg wrote an impressive series of operetta-style numbers for the Oz sequences ("Ding-Dong! The Witch is Dead;" "If I Only Had a Brain"), but Arthur Freed, an Oz associate producer who was also the songwriter of such popular hits as "Singin' in the Rain" and "You Are My Lucky Star," thought the movie needed a ballad as both a showcase for Garland and as a bridge between the Kansas and Oz sections of the movie. Arlen, who composed the music for Oz, felt the pressure of Mayer's expectations, and he had a bad bout of writer's block until one evening he had a sudden inspiration will driving to the movie theater. He pulled over outside the Hollywood landmark, Schwab's Pharmacy and wrote the tune in about 15 minutes . "It was as if the Lord said "Well, here it is, now stop worrying about it" he remembered. Arlen immediately shared the wistful melody with Harburg, who was the team's lyricist. Harburg always had the idea that the song should be about a rainbow -- he felt that a rainbow would be the only really colorful thing in Dorothy's drab existence -- but he couldn't find the right phrase for the first stanza of the song. He tried out "I'll go over the rainbow," "Someday over the rainbow," and "The other side of the rainbow" before coming up with the magic phrase, "Somewhere over the rainbow." Still, not everyone at MGM immediately saw the magic in Over the Rainbow. Director Victor Fleming wanted it cut out because he thought it slowed down the movie, but Freed, Arlen, and Harburg put up a fight until the song was restored at the behest of Mayer himself. Over the Rainbow was an immediate success. The song's wistful longing for happier times touched a chord with audiences who were struggling through the dark days of the Great Depression and the beginning of World War II. Garland recorded a successful version for Decca Records (clip below), and Arlen and Harburg received a much-deserved Academy Award for best song. Over the Rainbow became a pop culture staple almost as soon as it was recorded. James Stewart warbles it in his Oscar-winning performance in The Philadelphia Story (clip below), and everyone from Frank Sinatra to Hawaiian singer Israel Kamakawiwo'ole have recorded their own versions. However, Over the Rainbow has always been most closely associated with Garland. The song's heartfelt longing for "somewhere where there isn't any trouble" mirrored the tragedies and triumphs in Garland's own tumultuous life, and, although she performed the song thousands of times, neither she, nor her audiences, ever grew tired of it. "'Over the Rainbow' has become part of my life," Garland wrote in a letter to Arlen. "It's so symbolic of everybody's dreams and wishes that I'm sure that's why some people get tears in their eyes when they hear it. I've sung it thousands of times and it's still the song that's closest to my heart." The clip below shows Garland singing Over the Rainbow in a live television performance. Arlen and Harburg's reminiscences about Over the Rainbow come from The Songs of Hollywood by Philip Furia and Laurie Patterson. 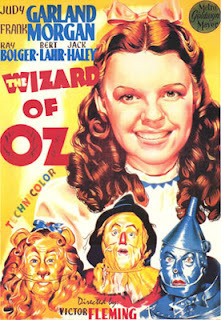 TCM will air The Wizard of Oz at 8 p.m. April 8. It is also available on DVD, Blu-ray, and video on demand. Next Friday, I'll look at "The Trolley Song" from Meet Me in St. Louis (1944).